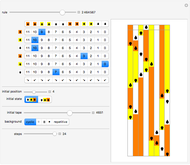 Turing machines are simple models of a computing machine invented by Alan Turing. They consist of a head that switches between states while reading from and writing on a tape. The symbols read or written are called colors. Generalizations of such machines can have multiple heads or tapes. 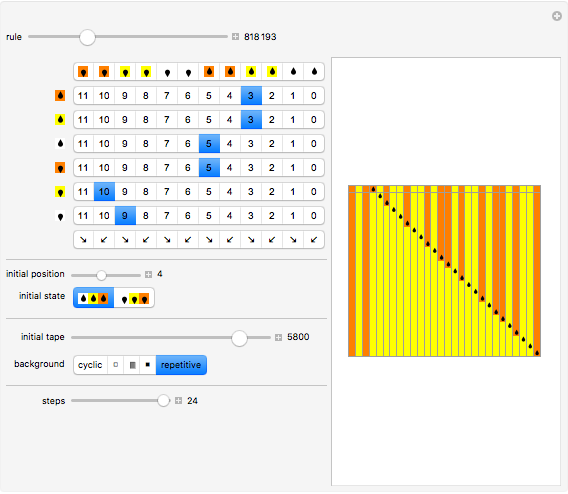 The plot shows evolutions of 2-state, 3-color Turing machines. Each row of squares gives one step in the evolution of the tape. 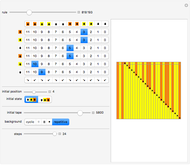 The squares correspond to bits on the tape: white squares represent 0-digits, yellow squares stand for 1-digits and orange squares for 2-digits. The small tears represent states: a falling corresponds to a 1-state, a rising disk indicates a 2-state. 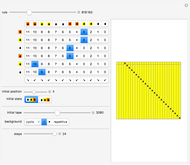 One of the 2985984 rules for a 2-state, 3-color Turing machine can be selected either with the slider or by setting the base 12 rule digits for each of the six possible inputs. 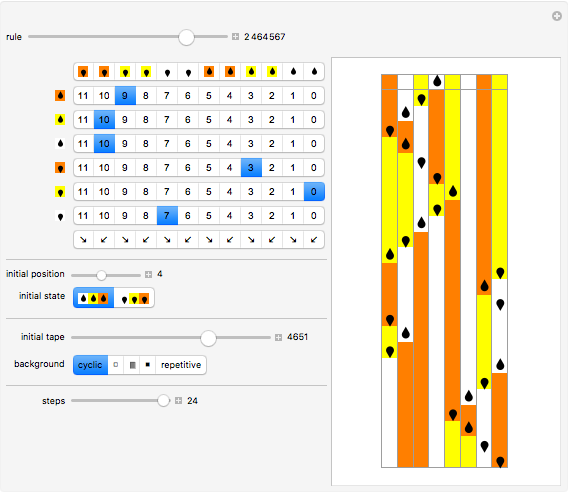 Combined icons for state and color on the left of these six setter bars give the inputs which trigger their selected settings. Similar combined icons over those six setter bars give the 12 possible right-hand sides of the rules. Another row of icons shows the resulting directions of movements for all possible results. 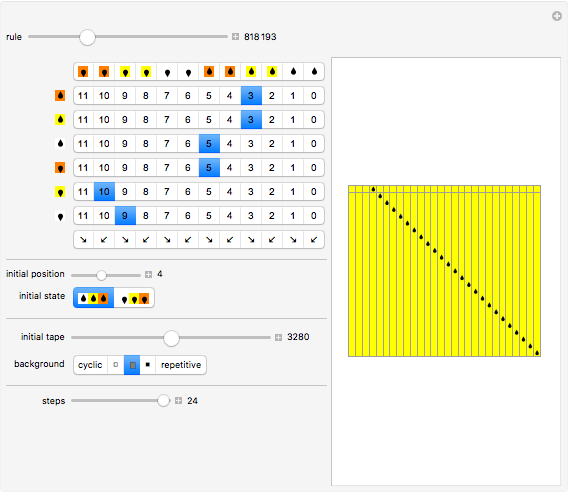 The initial position of the head is given in relation to the specified initial condition of the tape, which can be cyclic, padded by an infinite number of 0-, 1- or 2-digits, or padded by repetitions of the selected 8-bit initial tape specification. Michael Schreiber "Direct Rule Control for 2,3 Turing Machines"